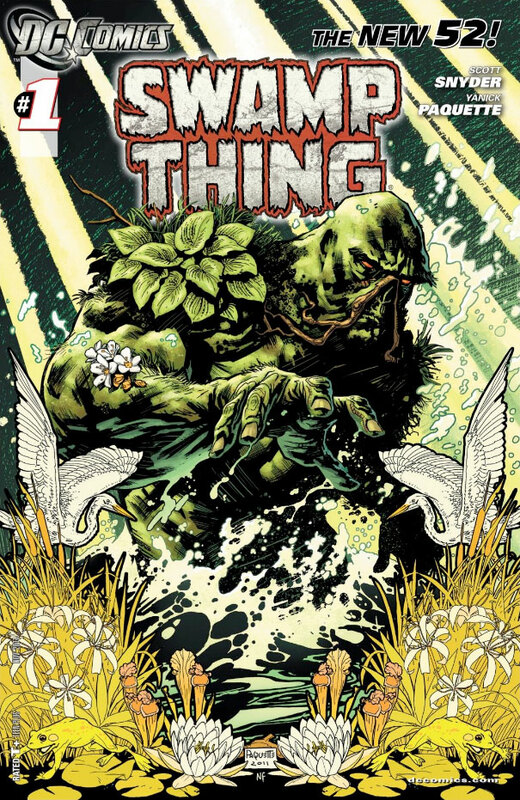 Like 51 other DC Universe titles, Swamp Thing started over with a new #1 issue in 2011. The goal of the initiative was to jump-start their sales by providing a jumping-on point for new readers, and DC committed a lot to it in terms of effort and publicity. But don’t call it a “reboot”, because they held onto most of their characters’ history. Swamp Thing vol. 5 was a textbook example of this, leaning hard on the legacy of the “plant elemental”. The series begins by reminding us of the greatest peril of the Shared Superhero Universe. It includes a brief appearance by Superman (the kind that used to be billed on covers to attract fans and boost sales) to introduce readers to the character of Alec Holland. What’s wrong with this is that it places the whole storyline that follows – placing all life on Earth in jeopardy, with Our Hero working (nearly alone) to save it – in a weird context. Supes is Chekov’s Gun, which never shows up again to be fired. 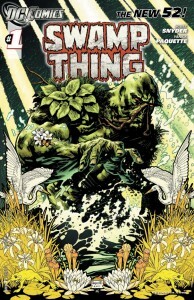 The thing that Swamp Thing is best known for among DC fans is the twist that Alan Moore gave the character when he took over writing it in the 1980s: rather than being a man who’d been transformed into a swamp monster, Swamp Thing was a creation of the Green – the semi-conscious entirety of plant life on Earth – which had taken on the memories of the man, who’d died in that swamp. The series since then has involved various gymnastics about whether Alec Holland is alive or not, and writer Scott Snyder now has him still alive… a separate entity from the swamp monster who thought he was Alec Holland. But then the swamp monster shows up to tell the man that this has to change. I admit that my annoyance with these splashes was fueled in part by the fact that I bought these issues digitally, and the double-page spreads were impossible to read without zooming in and scrolling around, and difficult to appreciate that way. But they seemed tedious and self-indulgent (and probably don’t work as well in paperback with the middles swallowed by the binding). And after a while, I stopped trying to read them, because it was clear I wasn’t missing much by doing so. I don’t want to imply that nothing happens in the first year of this series (reprinted in two paperback collections: Raise Them Bones and Family Tree). A new villain is introduced, Alec is reunited with Swamp Thing’s beloved Abby Arcane, the old villain Anton Arcane is brought back, and Alec finally becomes the Swamp Thing. But it reads like a 4-issue story padded to a dozen with a lot of pretty art. This entry was posted in October 2013 and is categorised as Sci-Fi, Superhero. You can leave a response, or trackback from your own site.